While rewatching Bones, I was reminded of how much I love Temperance Brennan’s jewelry. Since I first watched it, I have noticed that parts of my own collection tend to go in a similar direction. 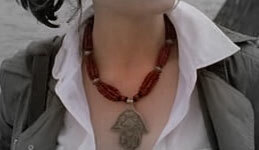 The jewelry tend to have an ethnic slant, either tribal or celtic. The big clunky necklaces don’t work on me, in my opinion, but I do love some dangly ear things.